When Nigerian President Muhammadu Buhari came to power in May vowing to mend the economy, fight terrorism and end corruption, Kola Karim was upbeat. Oil prices had sunk, but Buhari’s arrival made him believe his company still had a chance to prosper in Africa’s biggest crude producer. 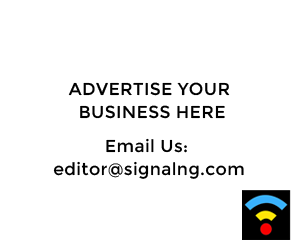 Shoreline Group, the third-biggest Nigerian oil and gas producer, decided to forge ahead with a $500 million Eurobond to expand drilling operations. Then prices fell below $50 per barrel last year. The bond sale was suspended. One hope was to rely on income from Shoreline’s construction and power-generation businesses. 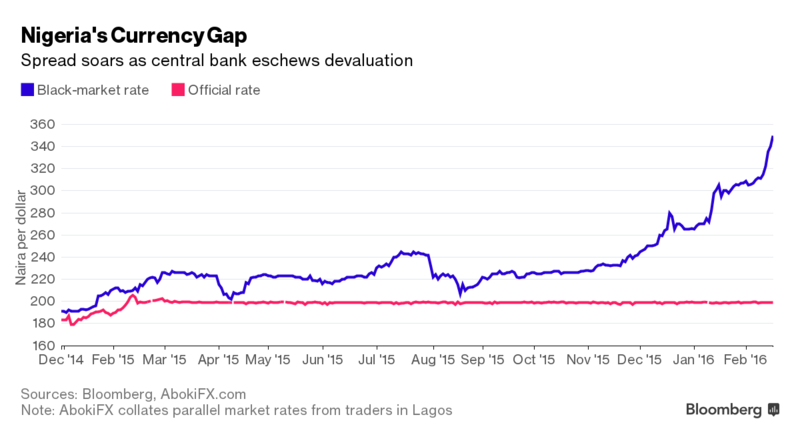 Except that the central bank’s refusal to devalue the currency meant Nigeria was starved of foreign exchange, crimping business operations. Now, with prices hovering around $30 a barrel, Shoreline plans to cut 35 percent of its nearly 2,000 staff. Karim’s struggle mirrors that of the wider Nigerian economy, Africa’s largest. And his difficulties show the challenges faced by Buhari, a 73-year-old former general who ruled Nigeria as a military strongman from 1983 to 1985. His task when he came to office was to push Nigeria to reform. Now he must help it survive. The government, which in 2014 relied on oil for two-thirds of revenue, can’t pay many teachers or finance infrastructure projects. With the economy growing at barely half 2014’s 6.3 percent, a recession can’t be ruled out this year, according to Morgan Stanley. 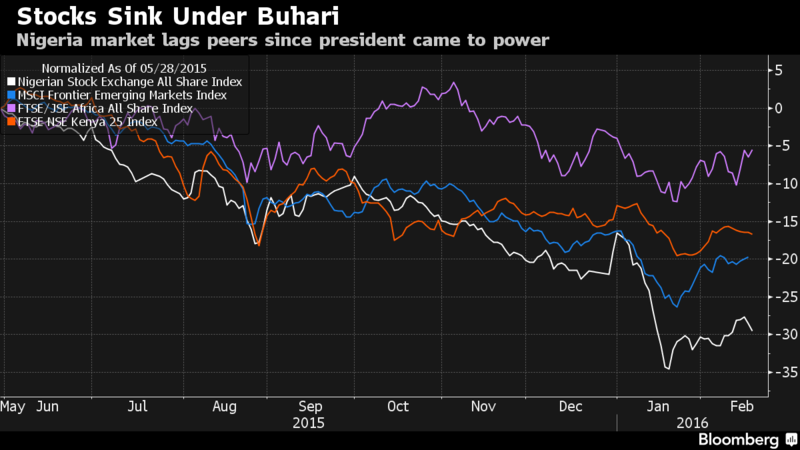 Nigerian stocks have fallen 16 percent since the end of December, the most in sub-Saharan Africa. This week, the black-market rate fell to a record 350 per dollar, 76 percent weaker than the official rate. Former central-bank governor Muhammadu Sanusi II in October told business leaders that Buhari and Emefiele were “in denial” over the currency. The president says critics will have to “work much harder” to convince him ordinary Nigerians will gain anything from a devaluation that foreign investors from Ashmore Group Plc to Investec Asset Management Ltd. think is inevitable. The central bank says a weaker currency would only accelerate inflation already at a three-year high of 9.6 percent. Buhari’s spokesman Femi Adesina said the president and his government have already responded publicly to questions about economic management. “There is no perfect policy,” Kayode Fayemi, minister of solid minerals development and former policy director of the ruling All Progressives Congress, said in a Feb. 8 interview. “We have an independent central bank and the central bank should do its job to convince the stakeholders” if a change in policy is needed. Nigerian authorities say they realize they need to diversify the economy. “For us, this is an opportunity,” Emmanuel Kachikwu, a petroleum minister and head of the state oil company, said last month in an interview at the World Economic Forum in Davos, Switzerland. Officials want to broaden the tax base by 5 million individuals and 500,000 companies this year, mostly by tightening enforcement. Nigeria’s government-revenue-to-GDP ratio is about 8 percent, the second-lowest level in sub-Saharan Africa after war-torn Central African Republic, according to the International Monetary Fund. South Africa collects 29 percent; Kenya 20 percent. The government says the tax measure, along with $9 billion of new borrowing from local and international investors and multilateral lenders such as the World Bank, will ensure the government can plug a fiscal deficit set to be a record $15 billion this year. Debt-service payments will be more than three times what is spent on education, and six times the expenditure on health. Buhari can claim progress for his anti-corruption drive, said Cobus Claassens, managing director of security company Pilgrims Africa Ltd. The president has sacked executives at the national oil company and ordered the new management to clean it up, while starting probes into whether the last government siphoned off billions of dollars meant for the military fighting Islamist militant group Boko Haram in the northeast. Some investors are also benefiting from gains made against Boko Haram, which has been dislodged from swathes of territory it held early last year. Still, the president’s economic policies are worsening the pain caused by falling oil prices, says RMB’s Gopaldas.